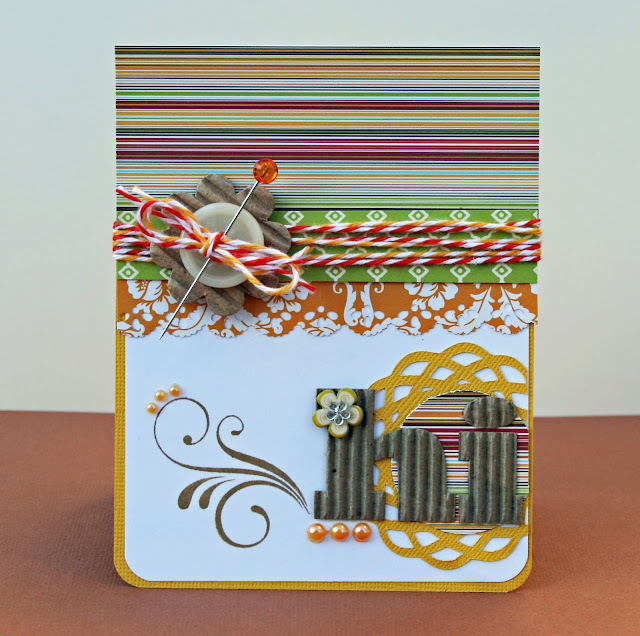 I have one more project to share from the November Citrus Tree Studio kit. I loved the blues and purples in this kit, so pretty and wintery without being too Christmasy. 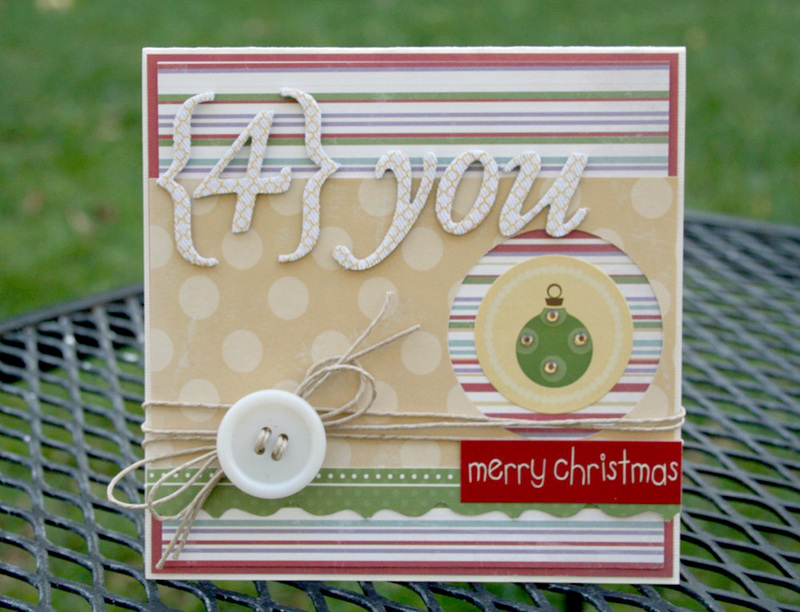 Lots of distressing on this card, with a big bow and some buttons. I loved the punch-out tickets that came in the kit! I hope you're having a good week so far. Lucky me caught my family's cold (a family that is sick together, stays together) and i've been battling it all week. I am hoping to be better by this weekend, we have holiday decorating and shopping to do! Be honest. You didn't think I could go this long without posting a recipe involving peanut butter and chocolate, did you. I've got a nice easy recipe today that involves one mixing bowl, an 8x8 pan and mini peanut butter cups. Did you know Reese's now sells a bag of mini peanut butter cups with NO wrappers?? That's right, no more wasting time unwrapping those little suckers before throwing them into my mouth the mixing bowl. 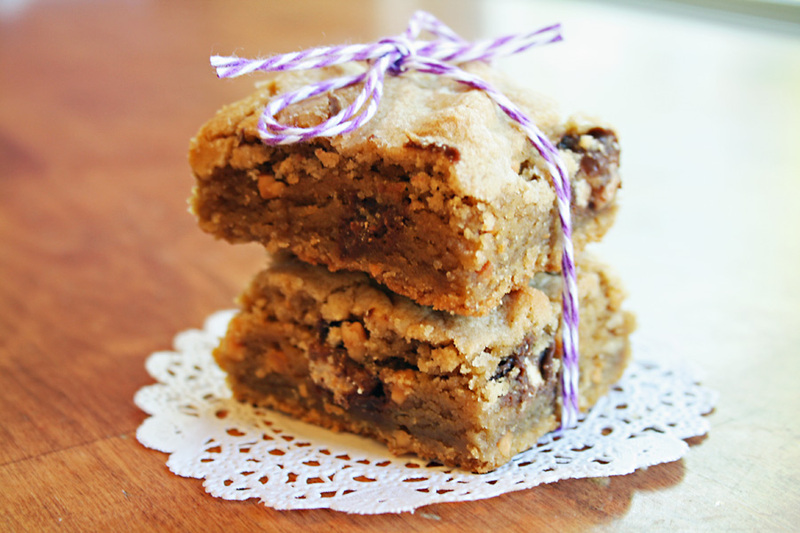 These bars are a nice combination of a blondie base and peanut butter cups. It's quick and easy and would look lovely on your holiday cookie platter. 1. Preheat oven to 350. Line an 8x8 pan with foil and spray with non-stick spray. 2. Combine melted butter, brown sugar, peanut butter, egg, and vanilla. Mix well. 3. Add baking soda and flour. Mix until just combined. 4. Add peanut butter cups and mix until well incorporated. 5. Spread evenly in 8x8 pan. Bake for 20-25 minutes. 6. Let cool before cutting into squares. Well, I didn't plan to fall off the blog world like that. We have had a busy week! We were traveling to my mom's for Thanksgiving and my son came down with a fever the night before we were going to leave. He ended up being okay to travel but then my daughter had an earache. And then my husband came down with it. Despite that, we had a nice holiday and saw most of my family. We also went to see the new movie Arthur Christmas which was super cute! Now I have one day of rest/regrouping/taking care of sick husband before work and school starts on Monday. How was your holiday? Did you brave the stores on Black Friday? Or shop from the warmth of your computer chair? Either way, you might need a holiday card to give with your holiday gifts you just purchased. 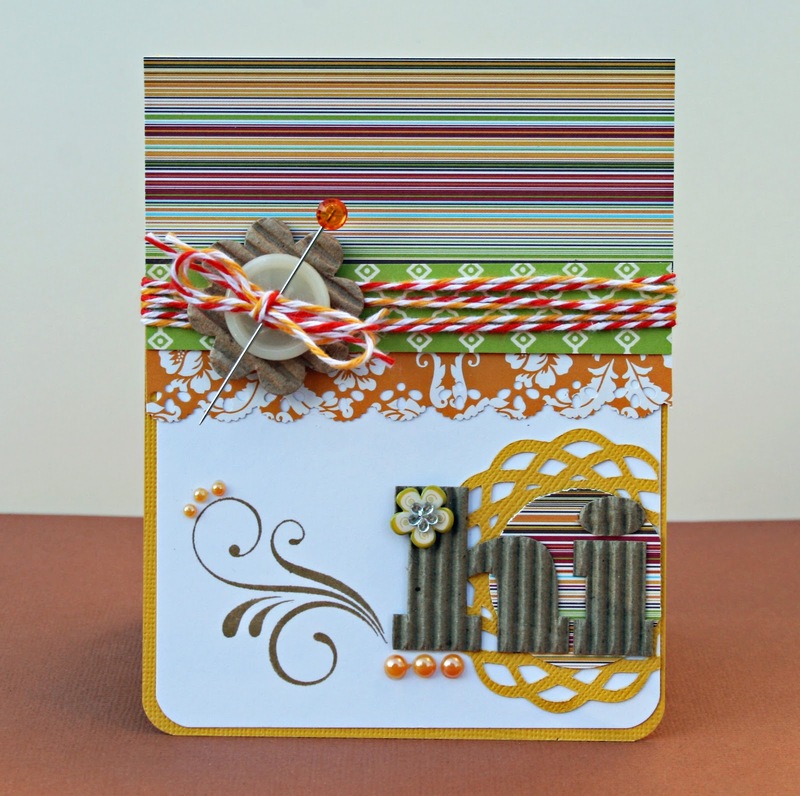 I used the November Citrus Tree Studio kit for this card. I love those Thicker letters, such a fun pattern! And here is something new I learned. 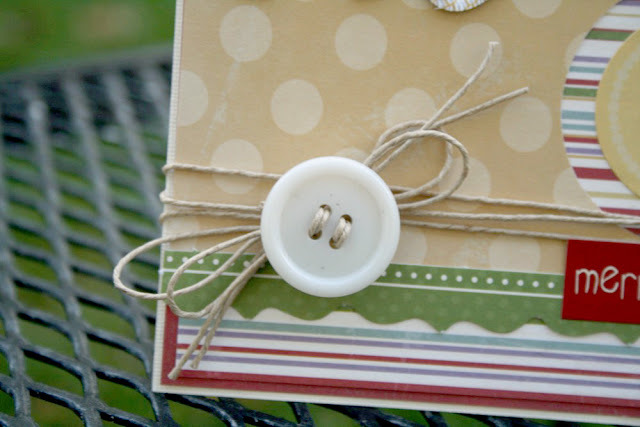 If you string a button backwards and tie the bow behind the button, it looks pretty cool when you attach it to your card with the bow in the back. I learn something new everyday! I hope you had a fabulous holiday weekend with your friends and family and maybe the new friends you made standing in line at 4am Friday morning. Enjoy the rest of your weekend!! Happy Monday before Thanksgiving!! What's going on with you for the holiday? Are you traveling? Cooking? Baking? Getting together with family? I am very excited to have a short work week and I get to see most of my family this week. And I get to eat tons of yummy food, it's a win-win for sure. I do feel a bit strange sharing a Christmas layout with you in November, but i'm sure I will get over it. 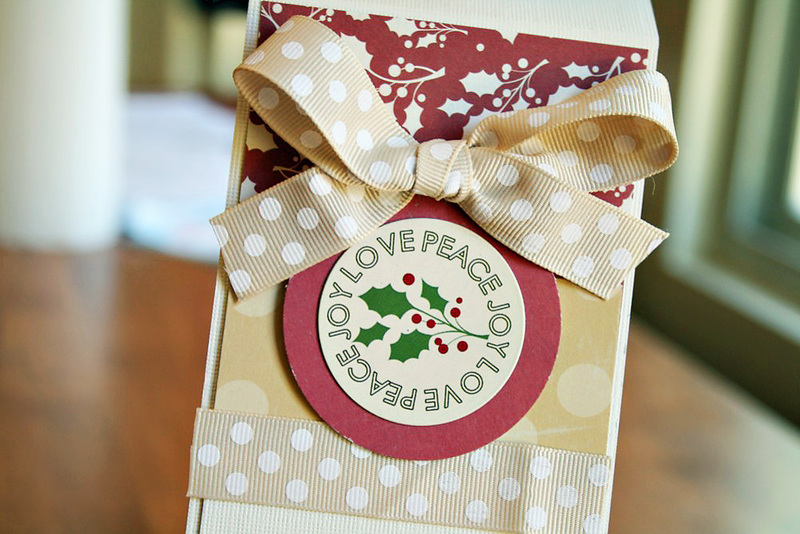 This was made with the November Citrus Tree Studio Kit, A Heartfelt Christmas. That is my daughter's favorite face to make when she's messing around or just doesn't want to smile for the camera (which actually is alot of the time!). I couldn't decide which photo I liked better, so I used both. I loved the punch out banners that came in the kit, so easy to add a banner to your layout. And those delighful stick pins that I love so much, I love using them to make flags! This kit really put me in the holiday spirit! Do you know what else put me in the holiday spirit? Having only 1 more day of work this week, yeah!!! I hope your holiday plans are coming along, whatever you have on your schedule. Thanks for stopping by today! A few girlfriends and I have been getting together for a baking night. We meet at someone's house and bring 1 or 2 recipes to bake together and try out. It usually involves a yummy cocktail and lots of flour, sugar, and chocolate. 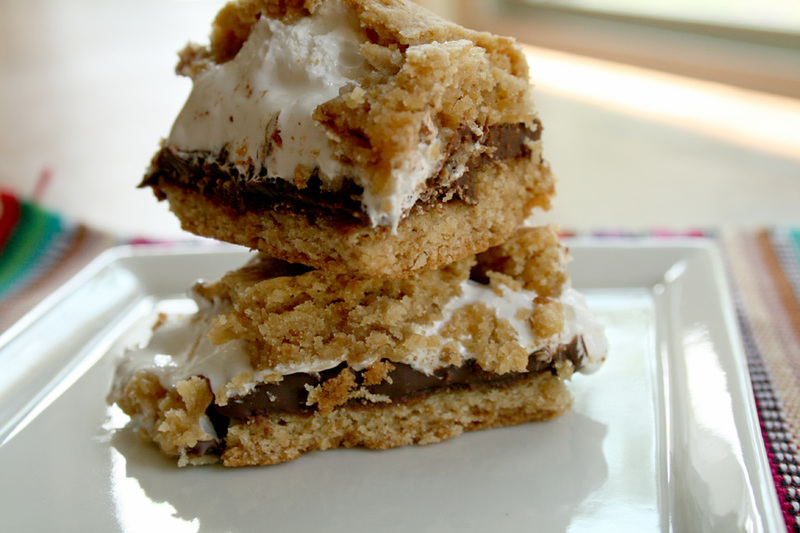 Last night I brought a new recipe I wanted to try, S'more Cookie Bars. 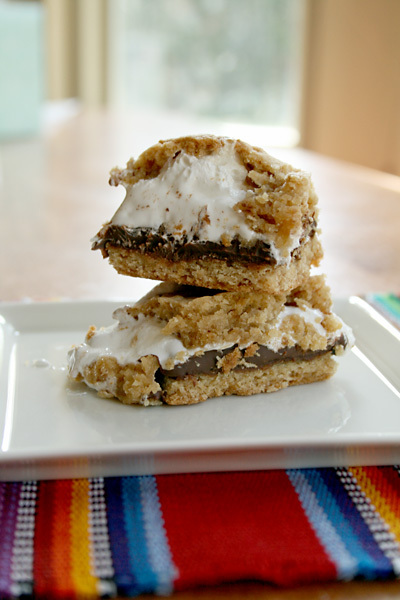 You know, graham crackers, chocolate, marshmallows...all the good stuff in a pan. No more gathering wood for the campfire, people! Oh, these bars were sooo easy to make! But they were soooo hard to cut into presentable squares. When I make them again, I will put the pan in the fridge and let them really harden up before cutting into them. While they look a mess, they taste fabulous. I did use marshmallow fluff for the filling. It's not easy finding real marshmallow fluff on the West Coast. It's typcially an East Coast thing. I was lucky enough to have a jar since a friend of mine brought me some from Boston. But I think marshmallow creme would work the same. I love taking my time to make a card. I love the whole process, picking out paper, pouring a glass of wine, finding matching embellies, picking out just the right sentiment, listening to 80's alternative music, layering papers, all of it. But seriously, sometimes you just need to make a quick card. Because there's laundry and dishes and work and school and cleaning and Pinterest and The Real Housewives of Beverly Hills. And there's no time for layering and picking and finding. I found a sheet of My Mind's Eye banner stickers and clapped my hands with glee. 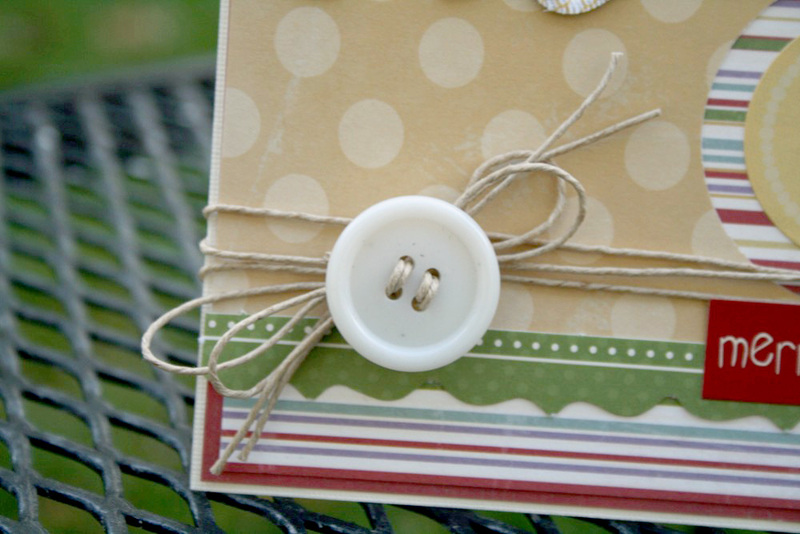 Add some baker's twine, pre-made flower embellishments and a stamp...and you got yourself a quick card. There's my quick card! Now I can go catch up on my Beverly Hills Housewives, what is up with Adrienne's extensions this season??? 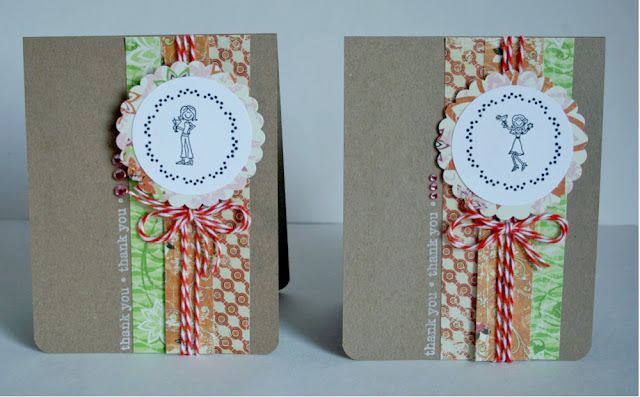 With the holidays approaching quickly, I am always looking for a fun, quick way to dress up a hostess gift. My husband is a homebrewer and homebrew always makes a nice hostess gift. Wine and vodka (for those martini lovers, I know you're out there...) are nice too, depending on your vice. And a bottle tag is a great way to dress up those bottles! I used the November Citrus Tree Studio kit for these bottle tags. And they are very easy to make. All you need to do is measure the length of your bottle and the length you want hanging in front (as bottles are not all the same dimensions). Also measure the bottle width. Cut your paper the appropriate width and add 2 inches to the height you want. This will account for the score line and the hole punch. For these tags I scored the paper 2 inches in and used my 1 inch hole punch. Then all you have to do is embellish as you wish! 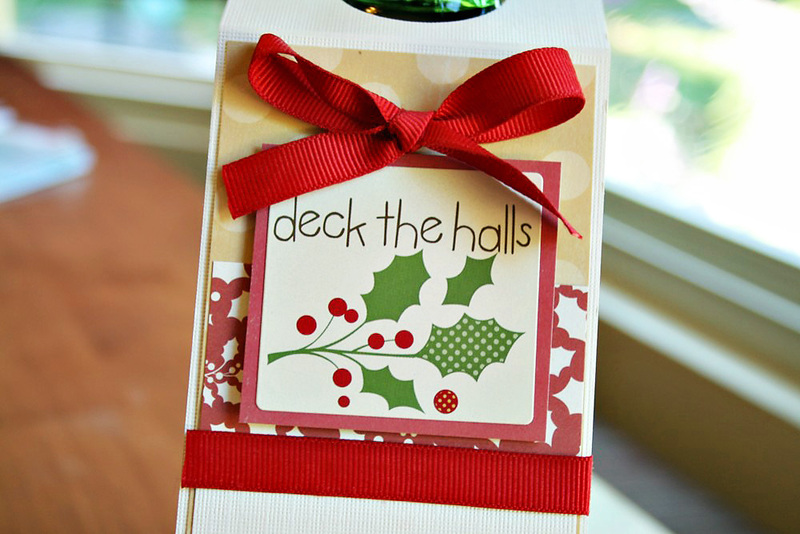 Some ribbon, matching patterned paper, and a holiday sticker is all I needed for these bottle tags. Now I already have 2 tags for the holidays. I'm thinking of making some for Thanksgiving, too. Because wine and homebrew is appreciated any time of the year. 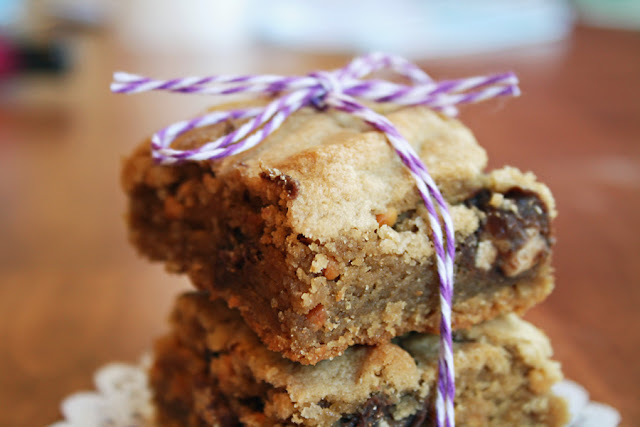 Everybody needs a good chocolate chip cookie recipe in their recipe box. A good chocolate chip cookie recipe is a great jumping off point for all different kinds of cookies, including M&M cookies. And these are some of the best i've tried. So these aren't exactly GIANT but you could definitely make them bigger. When I baked these for a party, I was trying to get a certain amount so I could make sure everybody had at least one. 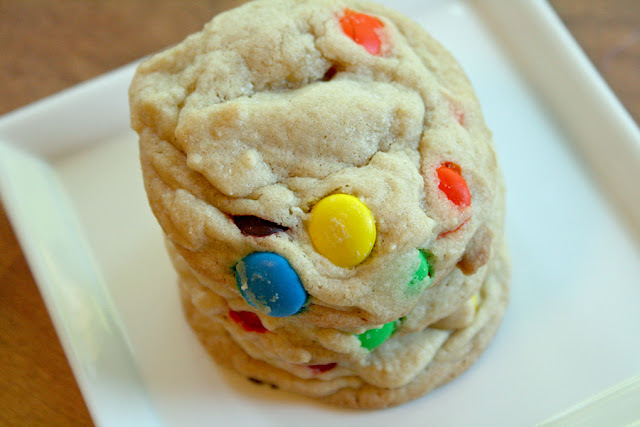 This is a great chocolate chip cookie recipe and those M&M's just add a great pop of color. I have quite a few CCC recipes in my recipe folder, and this one is currently on the top. I can't wait to experiment with it more by adding different mix-ins. 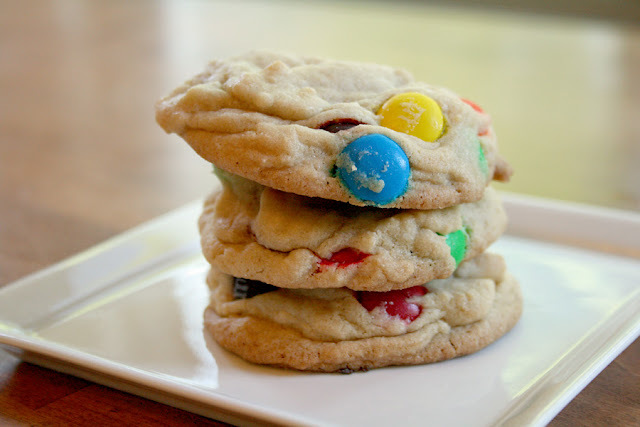 Add in some holiday M&M's and these would look great on a holiday cookie plate! Please head over to the How Sweet It Is blog for the recipe: Giant Rainbow Cookies. Take a second (or a few hours) to check out this food blog. It's one of my absolute favorites!! Are you in the holiday mood yet? I can't even walk through a store without being hit with holiday decorations, goodies, and music. This month's Citrus Tree Studio kit, A Heartfelt Christmas, is sure to put you in the holiday spirit, too! 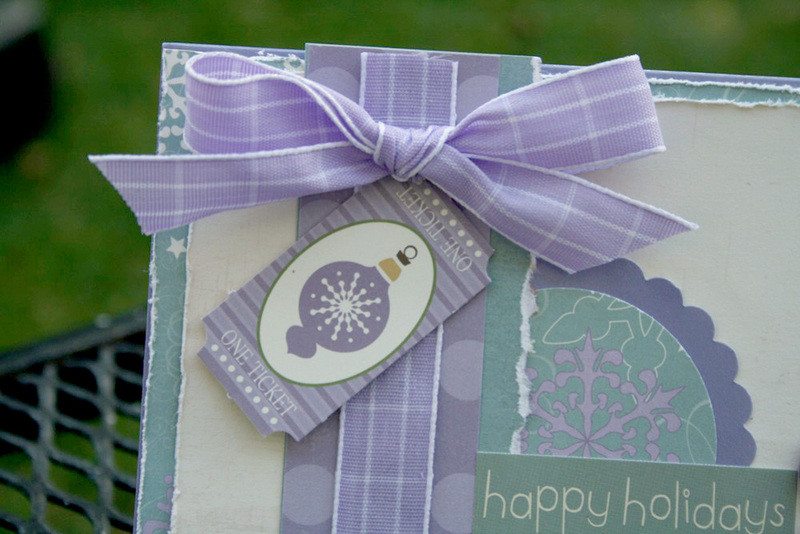 Isn't this a fun color combo for the holidays? I love the addition of purple and blue for the holidays. Santa also bring my kids M&M guys for their stockings, he has since they started getting stockings. I used my Cricut for the doily up in the corner. And a few of my dwindling stick pin stash to make these fun flags! I am in the mood for some holiday baking! My to-bake list is overflowing, as usual. I will have to figure out a way to cut it down a little bit. Are you feeling the holiday spirit yet? For the card contest I was participating in, I had to make one last card, just in case I made it to the final round. The card was supposed to contain some of our favorites...favorite manufacturer, favorite technique, and favorite tool. See if you can guess what I used. Pretty obvious I used tons of Jillibean Soup!! The paper, the corrugated letters and the corrugated shape are all Jillibean Soup. I will never get tired of their products. For my technique I used lots of layers. I'm not even sure that's a technique, but that's my story and i'm sticking to it. My favorite tool is my Cricut, which I used to cut the doily. 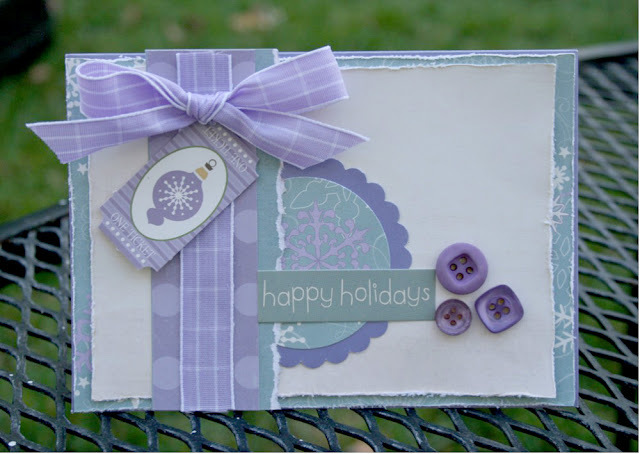 I love my border punches, which I also used on this card. I am down to my last stick pin in my stick pin stash. I need to start looking around for more of those, they are a fun embellishment! Thanks for checking out my final-not-so-final card. Happy Tuesday!! Happy Sunday everyone! We had a gorgeous day yesterday for soccer and today...it's pouring rain. My son has basketball tryouts today. Thankfully that will be inside. Speaking of thankfully, I would like to THANK all of you for voting for me during the Practical Scrappers card contest. I didn't make it to the final round but I truly appreciate all the votes and the time you took to check out my entries. Thank you friends! And speaking of thankfully again, do you send thank you cards? I make a big deal to my kids about sending cards after their birthdays and the holidays. But do you know what? Even though I love to make cards, I don't always get mine in the mail. Bad scrapper!! I know how nice it is to get a thank you in the mail. So I was determined to send some cards out this year for birthday gifts. So I pulled out a bunch of 6x6 paper pads, their scraps and got started. For these, I used Bo Bunny papers, baker's twine, U.B.U. stamps from PSA Essentails, Hero Arts thank you stamp and some random bling. Easy to layer, tie, stamp and complete! By using the same card design, I was able to create 6 cards in a short period of time. I used materials that would be almost flat so I could actually send these in a regular envelope. While I love making cards that have lots and lots of layers, sometimes I need one to actually fit in a regular envelope! I hope you're having a great weekend so far, Enjoy your Sunday!! Happy Friday everyone!! 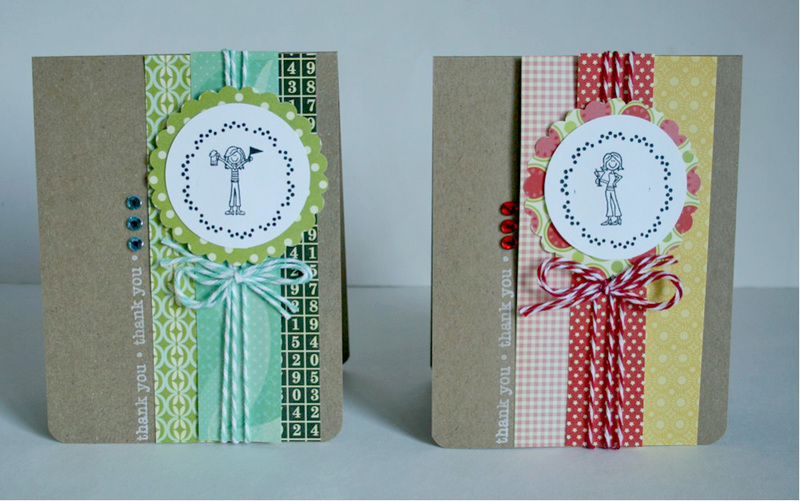 The November Citrus Tree Studio kits go on sale tomorrow, but i'm going to give you a sneak peek today. This kit really put me in the mood for the holidays and it was fun to pull out photos from holidays past to create some layouts. I created a photo collage at Walgreen's of random photos from Christmas morning. I printed it out 8.5x11 and then added it to a 12x12 piece of cardstock. Some fun tags, baker's twine, and journaling spots round out the layout. Now that I look at this layout, I'm thinking it needs a title. At the time, I decided to use the title on the journal spot as my layout title but now I don't think it works. The layout looks a little bit naked to me. Should I go back and add a title? Across the top? What do you think? Anyway, stop by Citrus Tree Studio tomorrow for a full reveal of this kit and there is another kit being offered this month. Lots of goodies going on sale tomorrow! You can still vote in the Practical Scrappers card contest...please go ***HERE*** to vote! You can vote until Thursday!! Since I'm sure some of us have over-indulged in Halloween candy and treats over the past few days, I thought I would post a healthier recipe. Please, don't fall down from shock. I do try to eat healthy 80% of the time so I can indulge the other 20%. But lately it seems like those percentages have flip-flopped and i'm trying to fix that. I found this recipe on one of my favorite healthy living blogs, Beth's Journey. Beth has lost a ton of weight using Weight Watchers and exercise and has some great recipes on her blog. This is one of them. I like eggs for breakfast but my typical-last-minute-freak-out-i'm-late-for-work routine in the morning doesn't always leave time for me to whip up some eggs. 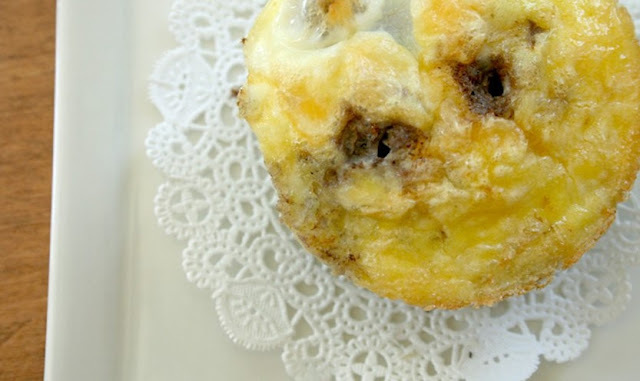 These egg muffins are easy to make the day before and they store well in the fridge. Just heat them up in the microwave, and you're set. These are egg muffins with black beans, red peppers, a bit of cheese, salsa and onions (if you like that sort of thing). They are great for breakfast or lunch. I took 2 to work, heated them up, threw them on a tortilla with some extra salsa and enjoyed them for lunch. With all the sweets i've been eating lately, a nice protein rich breakfast is what I need in the morning! 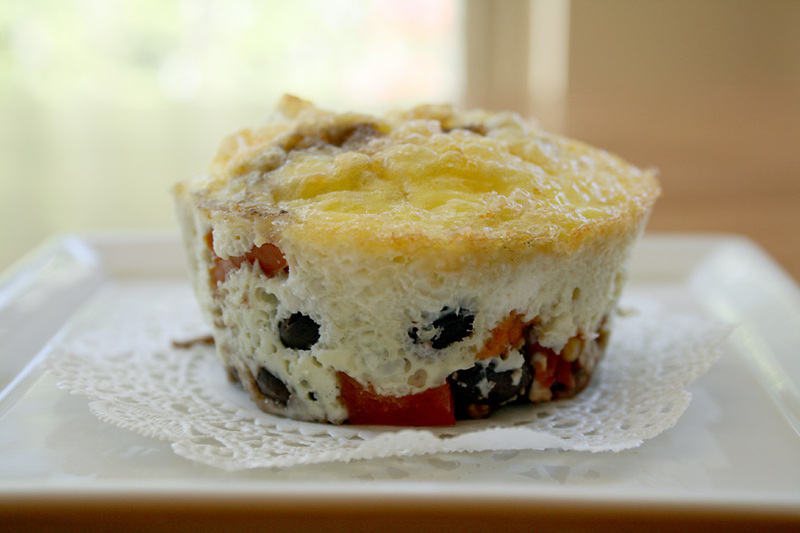 Please visit Beth's Journey for the recipe AND a great photo tutorial: Mexican Egg Muffins. Who knew that my cupcake pan could create something savory and delicious too! Happy Tuesday! I have a card to share today that will be perfect for a thank you card, a thinking of you card or just a thanks, friend card. 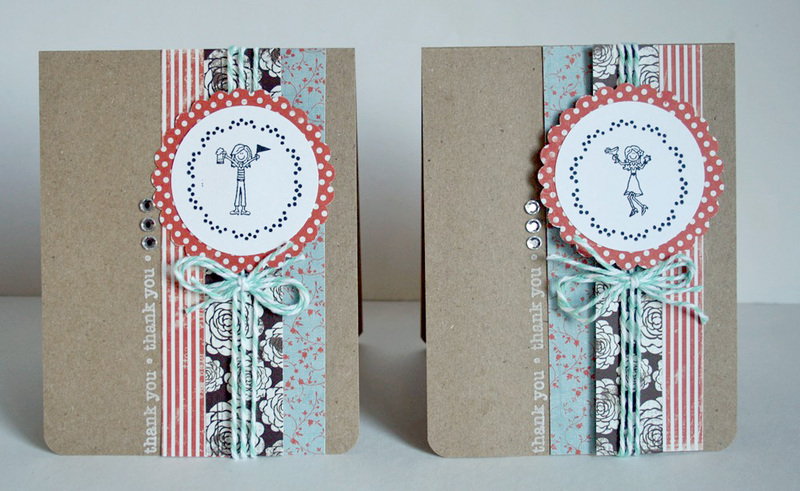 I love these handwritten sentiment stamps from Papertrey Ink. I think it's my most used Papertrey set. I used the Hometown Summer papers by Pink Paislee again. I really love the bright, fun colors of these papers. And this is a great example of a ribbon bow that I struggled with for 15 minutes. I just never got it to look 'just right'! Sometimes you just have to let things go, ha ha!